The 2018 AutoZone Liberty Bowl will play host to Missouri Tigers vs. Oklahoma State Cowboys! The AutoZone Liberty Bowl is an annual college football game that takes place in later December or early January. 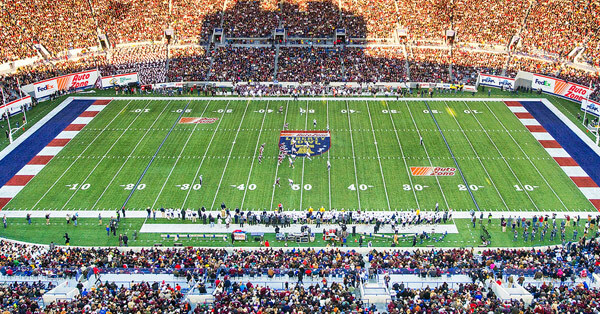 For an unparalleled experience, buy your ticket here at TicketGalaxy.com, the Official Ticket Exchange Partner of the Liberty Bowl, to witness one of the largest NCAA bowl games of the year! The Liberty Bowl occurs annually at Liberty Bowl Memorial Stadium in Memphis, TN. It is the seventh-oldest college bowl game. The Liberty Bowl was founded in 1959 in Philadelphia, PA. The first-ever match-up featured Penn State vs. Alabama. Penn State beat Alabama 7-0. The Liberty Bowl was held in Philadelphia for five years before briefly moving to the Atlantic City Convention Center. Since then, it has consistently been held at the Liberty Bowl Memorial Stadium. Liberty Bowl Memorial Stadium has a seating capacity of over 59,000, and year after year, the Liberty Bowl stands are filled to the top! Major teams that have played the Liberty Bowl include Georgia, South Carolina, Ole Miss, and many more. Get your Liberty Bowl tickets here at Ticket Galaxy! Purchase your Liberty Bowl tickets at Ticket Galaxy! Choose your event date and click "Find Tickets" to bring you to our array of seating options. Select your tickets on the maps page by clicking the price box. From there, TicketGalaxy.com will bring you to our checkout. Get your Liberty Bowl tickets quickly and easily today!